In celebration of the 450th anniversary of William Shakespeare’s birth on 23 April 2014, this display will explore Shakespeare’s works as inspiration for a multitude of theatrical interpretations through the centuries and across the globe. Shakespeare: Greatest Living Playwright will take Shakespeare’s First Folio as its centrepiece. This collected edition of 36 of Shakespeare’s plays (excluding Pericles) was published in 1623 and contains the first known versions of many of the plays. Without it, eighteen of the works would be unknown today, including Macbeth, The Tempest, and Twelfth Night. Surrounding the Folio will be new interviews, archive footage and photography, and twenty-five objects from the V&A collections, to explore how the plays have been interpreted and re-imagined by successive generations. At the heart of the display will be a specially commissioned audiovisual installation by Fifty Nine Productions featuring interviews with contemporary theatre practitioners. Leading actors, directors and designers will consider their relationships with Shakespeare’s plays, including Simon Russell Beale, Lucy Osborne, Edward Hall, Julie Taymor, Cush Jumbo, Sinéad Cusack and the Belarus Free Theatre. Illustrating the interviews will be recorded excerpts of Shakespearean performances from the V&A’s National Video Archive of Performance, and images from the Museum’s collections. This material will be projected onto a constellation of screens to represent the seeming infinity of interpretations of Shakespeare’s works. 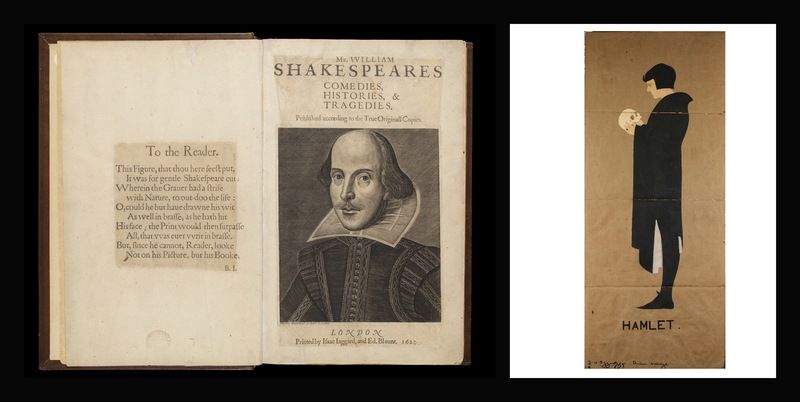 Objects on display, including props, costumes, set models, design sketches and printed ephemera, will illustrate past productions of Shakespeare’s works. Amongst these are a skull used by Sarah Bernhardt during her role as Hamlet in 1899, and the embroidered handkerchief used by actress Ellen Terry whilst playing Desdemona in 1881 at the Lyceum Theatre. Costumes include a headdress by the prominent society designer Oliver Messel, worn by the actress Vivien Leigh during performances of A Midsummer Night’s Dream in 1937, and a pair of red boots worn by actor-manager Henry Irving in an 1877 production of Richard III. With a stacked right heel, the boots helped Irving to perform with the character’s distinctive limp. Designs on paper for both set and costume will be shown, such as a 1945 costume design by Roger Furse for the character of Falstaff, which depicts a realistic ‘fat-suit’ to be worn by Sir Ralph Richardson. Interpretations of theatrical sets will be explored through a 1772 set design for Richard III by the innovative designer Philip James de Loutherbourg, which suggests a free-standing bridge, and Sally Jacobs’ 1970 set model for director Peter Brook’s production of A Midsummer Night’s Dream, which shows the stage transformed into a circus space. Examples of theatrical ephemera will also be displayed including a ticket to a 1769 Shakespeare Jubilee. Further insight into Shakespeare’s life and legacy is provided through a mural designed by Jonathan Barnbrook, which includes statistics about the playwright’s works, their global reception, and famous phrases which have their origin in the plays. Shakespeare: Greatest Living Playwright will be accompanied by a varied programme of activities and events at the V&A celebrating the 450th anniversary of Shakespeare’s birth and examining the enduring influence and popularity of the world’s most famous poet and playwright.